Laughter Associates - Lotte Mikkelsen - Your Everyday Laughter Queen! Lotte Mikkelsen – Your Everyday Laughter Queen! 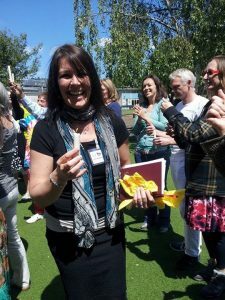 There are more than a thousand Certified Laughter Yoga Leaders spread around the UK, and there are a few hundred Certified Laughter Yoga Teachers covering the UK and teaching new Laughter Yoga Leaders. Know your laughter professional before your training. There are some less qualified laughter teachers who promote themselves as professionals. Many leaders and teachers regularly report complaints, concerns, and other issues with unqualified leaders and teachers who do not have a Laughter Yoga or Laughter Therapist certification. I work with the majority of the Certified Laughter Yoga Teacher who have trained with me over the years as well as Laughter Professionals who have trained elsewhere, e.g. with Dr. Madan Kataria or other recognised schools. The Certified Laughter Yoga Leader Training in London is currently co-facilitated by me and Mel Bloch of Stanmore Laughter. In the past I have run this training with Julie Whitehead who is now co-facilitating the Certified Laughter Yoga Leader Training in Chichester together with Lisa Sturge of Laughter Lines Coaching. Being a Member of Laughter Association UK, the official body for laughter professionals, also allows me to work with and recommend professionals who have their certification and professional insurance in check. If you find it a challenge to locate a Laughter Professional in your area or for your event please do get in touch, I am not saying I know everyone but I do know quite a large number having trained over 1,000 leaders and almost 160 teachers. They are FANTASTIC!